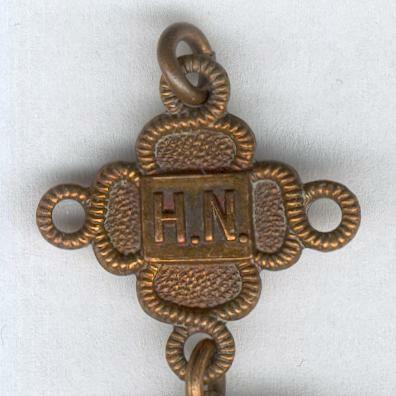 Miniature bronze medallion in the form of a cross bottony with eyelet and loop for wear; the face with a circular central medallion hatched for the heraldic colour sable (black) with a Maltese cross, plain for the heraldic colour argent (white) with a lion between the arms upper left and lower right and a unicorn between the arms lower left and upper right, all within a ring inscribed ‘THE ST. JOHN AMBULANCE ASSOCIATION’, the ends of each arm of the cross with a St. John’s wort flower; the reverse with the engraved attribution ‘229206 / ADA TAYLOR’, inscribed at the base ‘REGISTERED AT / ST. JOHNS GATE / CLERKENWELL’; diameter 26.51mm (1.04 inches); with a bronze ‘1920’ re-examination label in the form of a rectangular bar with trefoil ends, the date ‘1920’ centrally, St. John’s wort flowers to either side, all with a stippled ground and rope border, round loops to either end and above and below the rectangle, the reverse numbered ‘229206’; also with a bronze Home Nursing pendant in the form of a square bearing the letters ‘H.N.’, set in a quatrefoil with stippled ground and rope border, round loops to left and right and above and below, the reverse dated ‘1923’ and numbered ‘229206’. 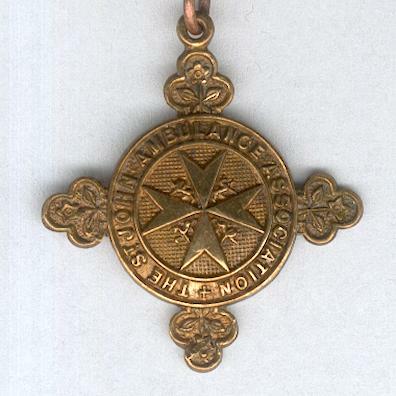 In 1879, two years after its foundation, St. John Ambulance Association introduced a medallion to be awarded to those who had passed three of its examinations. At least two of the examinations were required to be in First Aid to the Injured but the third could be in either Home Nursing or Home Hygiene. 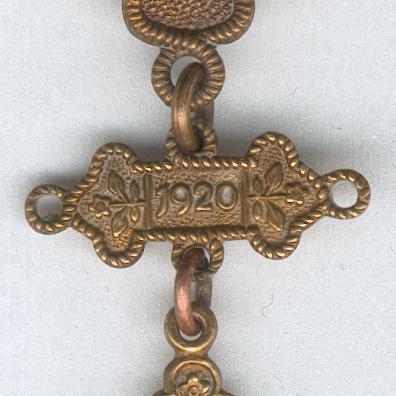 The First Aid examinations could not be taken at intervals of less than one year and thus the Medallion could be gained in either one or two years, according to the combination of subjects taken. 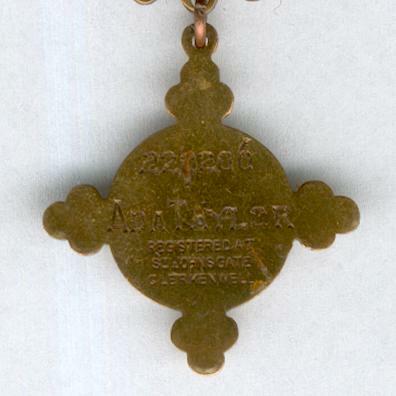 The Medallion was intended to prove, when necessary, the competence of the holder to render first aid to the injured. 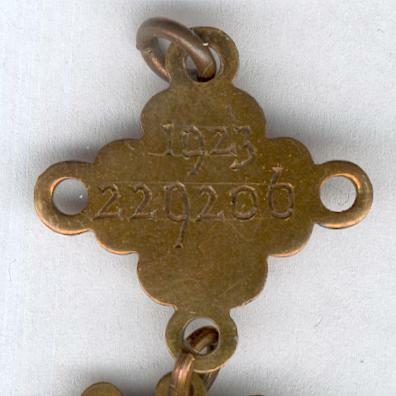 This fourth version of the medal is known to have been in existence by 1909; its issue ceased in 1992. 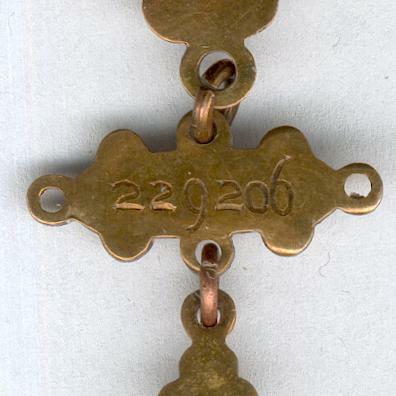 Year labels were introduced in 1905 and could be earned by a medallion holder for each successful re-examination at intervals of not less than 12 months after the third examination for the medallion. 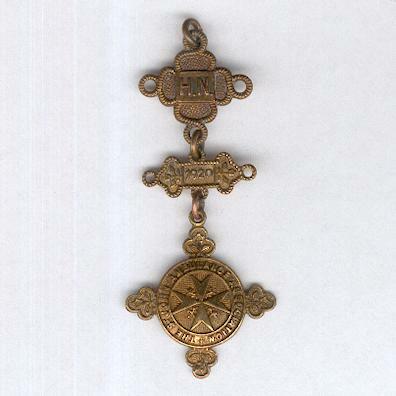 Pendants were introduced in 1916 to indicate specialist qualifications for those who had successfully re-examined in subjects other than First Aid. These were Home Nursing, Home Hygiene, and Sanitation.